Cardigan Sweater for Women. How to Crochet. There is nothing unique in this women's cardigan sweater. A simple pattern with the drop shoulders and cylindrical torso, a simple stitch pattern. But there is something in this simplicity that catches your attention right away. It looks like the answer is obvious. A designer who has created this cardigan had a clear idea about the features of the drop-shoulders designs and how to manage them. 1. Cardigan doesn't have to fit you exactly. A little extra ease will compliment both this women's cardigan and its owner. 2. It has to be long enough. Large elements of the stitch pattern require enough room to demonstrate their charm. Besides that a long silhouette will make you slender. 3. The number of the hook and thickness of yarn have to provide soft and easily draped fabric. It will allow cardigan to wrap the shoulders with smooth and natural lines. As usually, I don't suggest you to follow my example exactly. Let's look at the picturefirst, to understand the key moments of our project. As an example, we will use a drop-shoulders sweater pattern discussed earlier. To make it look like our cardigan, a few changes have to be introduced. Follow the steps below, to make them. Step 1. Make a gauge swatch (40 stitches) using a cardigan stitch pattern. There are three identical repeating vertical patterns and four rows crocheted twice (eight rows total) in this swatch. Measure height of the swatch and divide it by two. It will be width of the vertical bands for the front part (see the shape FF1BB1 on the pattern below). For example, height is equal to 10 cm. Distance FF1 = BB1 = 10 cm / 2 = 5 cm. Cardigan for Woman. Duplet # 73. Step 2. This sweater has a 3/4 long sleeve. Hence, for our example distance AL = 3/4 Arm Length + Neck-Shoulder Length = 3/4 AL + NSL = 3/4 x 56cm + 13 cm = 55 cm. Step 3. Calculate the number of stitches necessary to start your back and front part of the cardigan. You can crochet two front parts and back part separately and sew them together. But when you use a stitch pattern which has the large fragments like this one, it is much better idea to crochet all parts together. You will have much more freedom altering number of the stitches necessary. 2 x B1C + 2 x BC. If you look at the cardigan picture above and compare it to your gauge swatch, you will notices that the festoons of the hem line and sleeves "look" downward. It shows us direction of crocheting - from top to bottom. Nothing terrible happens if you use opposite direction of crocheting. But the edges will look differently. Step 4. 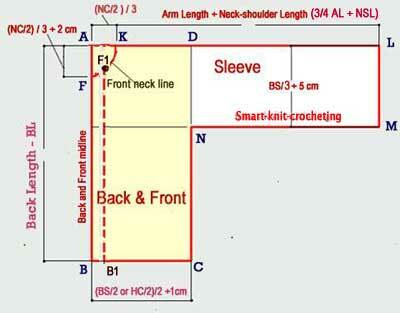 Calculate the number of stitches necessary for sleeves of the cardigan sweater. Start the sleeves from the shoulder and continue to the bottom hem. 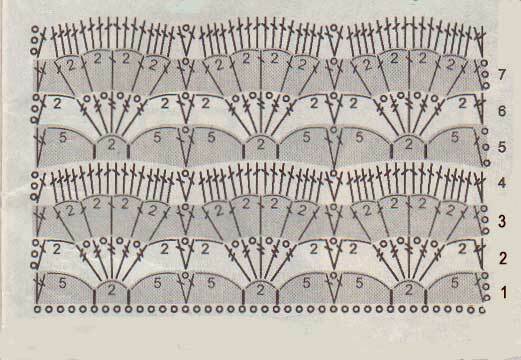 Check how to calculate number of stitches at Beginner Crochet page. International crochet symbols for charts can be found at Crochet Patterns page. Modern Russian language crochet magazine with a lot of patterns and pictures (color and BW). FREE shipping worldwide! Look inside Crochet Magazine "Duplet" , video tour is attached! 18 models, 26 illustrated master classes, 190 symbolic patterns for motifs! Knitted flowers, Irish laces for knitters, meshy flowers, Irish lace leaves, assembling by blocks, crochet yoke, crochet raglan, different motifs combination at one canvas, diagonal laces, filet laces butterflies, Bruge laces and lot of more waiting for you inside! Very useful issue for those who learn, teach or just want to improve your skill!